2013 is on life-support. There are only hours left until a brand new year begins. I’ve spent the last few days contemplating what I’ve gained this year and dreaming for 2014. The last several years, my year has revolved around my Word of the Year. I’ve gained so much from this discipline in my life. In 2011, my word was FREEDOM. 2012 was RISK. This past year my word was TRANSFORMATION. I’ve been thinking a lot the last few days about transformation – how has my life been transformed? As usual, what I thought would happen didn’t really happen. Funny enough, I didn’t have any specific dreams for transformation, but a general sense that I would be massively transformed. It’s been much more subtle. One of the things I’ve learned over the last 3 years of having a Word of the Year is it’s just the foundation. In other words, it’s just a beginning…not the end. 2o11 was just the start of me becoming free, I continued to see freedom since 2011. I continues to learn about and take risks this year. Because of various circumstances in my life, I had really begin to question my leadership ability, calling, skills, etc. The past couple of years I regained some confidence, but I was a little like a wet sculpture. 2013 I’ve begun to harden. I am secure in my position as a leader. Maybe the most important step in leading is knowing and being confident in your place. I know my place. This is a revelation I learned from my friend John. I’ve spent too much of my life fighting against (sin). Don’t give in. Don’t give up. Don’t quit! I need to fight for something. I need to build. I need to create. I need something bigger than me to dream about. This doesn’t mean I give into sin or temptation, but it means I have a purpose bigger than just avoiding or saying no to sin. I’ve found something bigger in Cross Points Church. I’m excited to help create a future in a place called to impact a city (Shawnee, Kansas). I’m finding something bigger in writing, and it starts with this blog. I grew up believing some people are creative and some people aren’t. That’s a lie. I’ve believed this lie, and I’ve been told this in subtle and overt ways over the years. Everyone is creative; we all create in different forms. I’ve begun to find a groove in creating. This year I helped develop and redesign the Cross Points Church website. I was in charge of all of the graphic design for the church – creating banners, posters, t-shirts, postcards and more. I designed and developed this website – andybondurant.com. 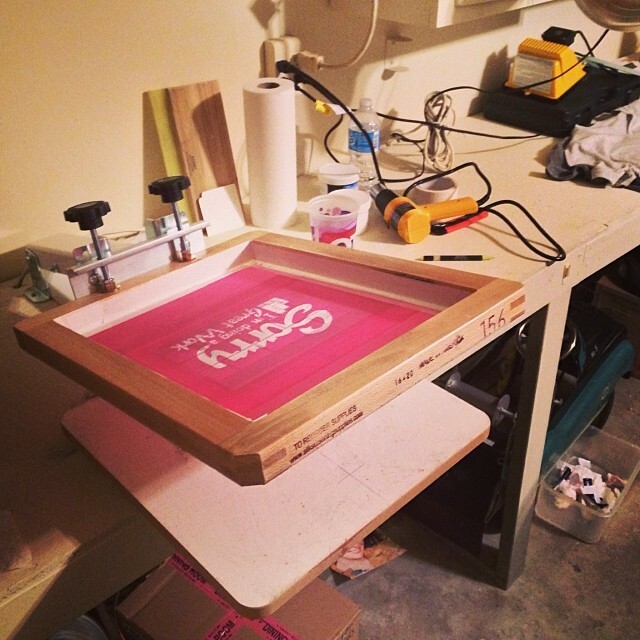 To cap it all off, I was given one of my favorite gifts in years – a screen printing kit! I’ve already printed 2 shirts with lots more ideas to come. Who knows, maybe I’ll create a t-shirt company in 2014! I had a revelation a few weeks ago. I shared about it in detail here, but in a nutshell I am worthy. I make mistakes. I fail. I am not God. God, however, in His grace looks at me as a son. He sees me as the redeemed person I am. It doesn’t matter how I see me, it matters how He sees me. For years, I’ve heard the benefits of journaling. I’ve never been a journal person – trying but never succeeding. Blogging has become my journal. I need to write. I learn more about myself by writing. I process by writing. I know I’ve been transformed more than I’ve shared here, but I wasn’t writing very consistently in 2013. If you are doing a Word of the Year project, you need to figure out how you process your word throughout the year. Kia needs someone to talk to – she has an accountability partner who serves as that person. I need to write. You may need a person, to write, to draw, to woodwork, to landscape or roast coffee. Now for my Word of the Year in 2014. I have some ideas, but I’m not settled on anything. I’ve been reading a short devotional on the concept – One Word That Will Change Your Life. You can find this devotional for free on the Bible.com. I look forward to sharing my word with you soon. Until then, what was your word in 2013? What have you learned? I wanted you to know I enjoy and appreciate your blog and the insights you share. Jerry – Thanks so much. I love that it is helpful for you, and I appreciate you taking the time to encourage me. Blessings on your 2014! 2014 marks my tenth year of blogging and I really resonate with your thoughts about it being a form of journaling. Bob – Thanks! 10 years is pretty impressive. I had to stop and think how long I’ve been blogging. I think I have archives back to 2006, so this would mark my 8th year – right behind you! Loved your post! My word for 2013 was eucharisteo (giving thanks). I’ve been learning and practicing giving thanks to God in EVERY thing, both the good and in suffering or hard times. My word for 2014 is communion, both with God and with those in my life. Jen – great words! Blessings on your 2014 as you commune (better) with God and others.